Golf took a backseat for one night at the famed rolling greens of the ICC golf course, Edina, Minn., for the launch of Save Our Monarchs Foundation. Held on a beautiful Wednesday afternoon overlooking the lush grounds, the monarchs carded an eagle of interest with the attending crowd. The Foundation, brainchild of entrepreneur Ward Johnson, has a steep objective: distribute one-million packets of milkweed seeds, the favorite sustenance of the Monarch. Why now? Johnson said, “This decline of the monarch has accelerated over the past decades; it hurts deeply.” An active gardener, he noted the lack of monarchs and decided to act. 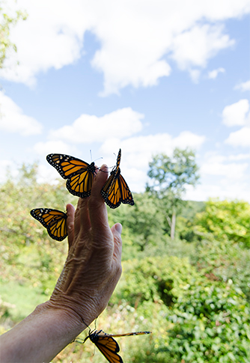 Photo moments not to be missed: Monarch release programs on Saturdays for a limited time. Through August 17, the Arboretum presents a live exhibit on monarchs in the Snyder Building’s Conservatory. 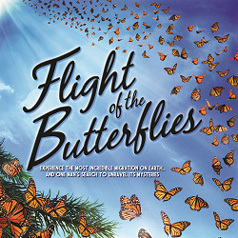 Titled “Butterflies: Beauty in Flight,” a visitor will be able to get “up close and personal” with the exhibit. Butterfly Release Days held Saturdays July 12 through the exhibit’s closing allows one to buy butterflies, either a Painted Lady or Monarch, and release them to the clicks of myriad cameras. Strong support with garden centers such as Linden Hills Co-op, Sunnyside Gardens , Wagner’s Greenhouse and Bachman’s along with retailer Goldy Locker Rooms aid in spreading the word . . . and milkweed seeds. 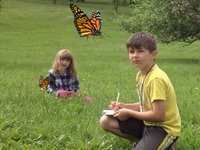 Can one imagine children never having the opportunity to enjoy the sight of a monarch butterfly? As habitats continue to decline faster than a snowball in July, the population of monarchs collapses. 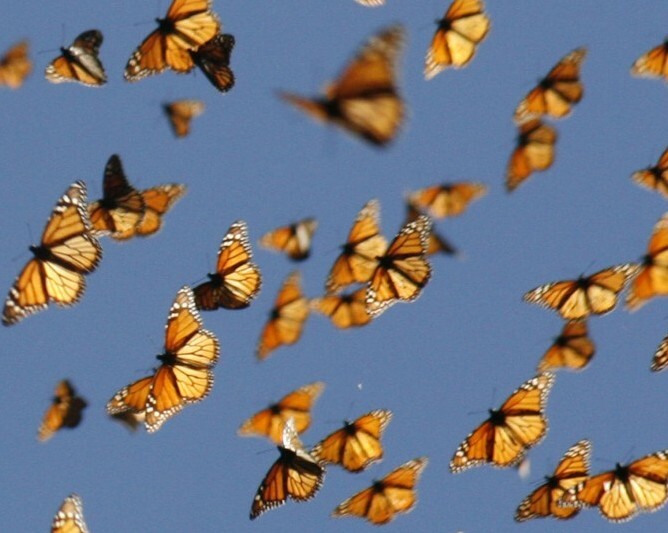 From more than a third of a billion in North America, the number of monarchs now is in the vicinity of just 35 million. In the last two decades, the population plummeted 80 percent. One attendee, Pam Neils, grew up on a farm in Maple Plain where caring and tending to Monarchs was a priority. “They loved to land on a finger to enjoy a touch of honey,” she told me. Richard M. Swenson who studied migration over 25 years, said he was “moved by the experience.” Maria Verven, Verve PR, stepped in to bring instant credibility to the Foundation’s work. Terrific packages mark various donation levels with T-shirts, rounds of ICC golf, and window clings comprising part of the loot. Do good and get goods; it is a deal fit for a monarch. This entry was posted in Features, General, Homepage Featured and tagged Bachman's, Goldy's, golf, Interlachen, Linden Hills Co-op, milkweed seeds, minnesota landscape arboretum, monarch butterfly, Sunnyside Gardens, Verve by Phillip Gary Smith. Bookmark the permalink.